​Hoi An attracts millions of visitors every year to its centuries-old relics, nights that are magically lit up by hand-made lanterns, and gentle activities like cruising on the Hoai River that flows through it. Literally translated as Quang (Quang Nam)-styled noodles, mi Quang is popular around the country, even among foreigners. It is recognizable with its thin, flat rice noodles glazed with a mixture of peanut oil fried with onion and usually yellow broth. 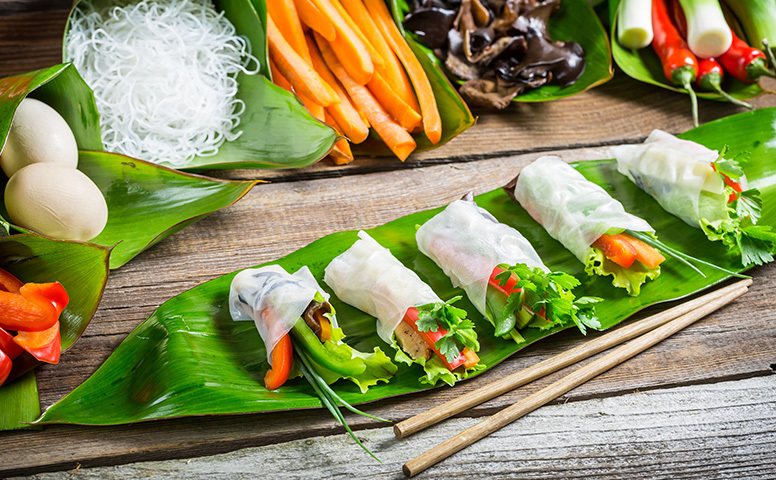 Cao lau is a rice noodle believed to have been invented in Hoi An. It is equally delicious but, for some reason, less popular than mi Quang. In a way it has some things in common with Chinese and Japanese noodles. Its al dente noodles, for instance, look raw and thick like Japanese udon. Its toppings include slices of pork that look like char siu or Chinese barbecued pork. Com ga, or chicken rice, is not exclusive to Hoi An, but locals have successfully improved on it, making it one of their signature dishes. A dish of chicken rice is mouth-watering with its pleasantly yellowed rice topped with hand-shredded chicken and herbs. It is served with a small bowl of soup containing some chicken giblets like heart and liver. The famous dish actually consists of two kinds of steamed rice dumplings. Banh vac is filled with ground shrimp, garlic, spring onion, lemon grass, and spices. Banh bao, on the other hand, has minced pork and mushrooms as the main fillings. Literally translated as cracked/smashed rice pancakes, banh dap is perhaps one of the simplest foods in Hoi An’s cuisine, but its contradictory textures easily makes the biggest impression on foreigners. Banh dap is actually a combination of two kinds of rice papers, one white, thin and kind of sticky and the other, dry, crispy and brittle. © Hoi An Silk Marina Resort & Spa. All Rights Reserved.